SPM is a leading manufacturer of storage equipment for the food industry. - SPM tanks ltd.
SPM is a leading manufacturer of storage equipment for the food industry. We produce tanks with the capacity of 0,1m3 to 5000m3 including pressure tanks for milk-, oil-, beer-, wine-producing and other industries. We can manufacture both vertical and horizontal stainless steel tanks on adjustable legs with heat insulation, agitators, level transmitters and other control devices. We manufacture also both stainless steel and carbon steel tanks for other industries such as chemical industry. We do engineering, transportation and erection works of tanks equipment. The biggest Russian and foreign companies are among our clients such as: Cargill, Unilever, Parmalat, Mars Lianozovo, Tsaritsyno, Kazan, Timashevsk milking plants, Danon Industry Ltd, Vamin Tatarstan, Anninskoe moloko milking plant, Baltika, Istok, Samara, Voronezh, Khabarovsk, Tula and Rostov breweries and others. 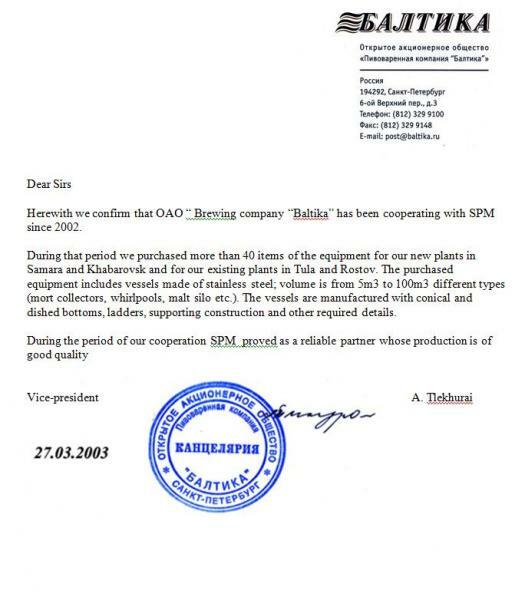 Our equipment is certified by State Sanitary Service of Russian Federation. We always respond to our customers’ needs with individual approach to each order. Our tank equipment is a guarantee of reliability and quality! SPM tanks ltd. possess of high-qualified personnel, equipped with all required utilities for manufacturing the tanks. Whatever kind the tanks are - stainless steel or carbon steel tanks for food or other industry - our equipment meets the highest standards. This is confirmed by our customers’ recommendations..
Cooperation with our company will help you to purchase tanks equipment of European quality at a low price avoid the custom clearance procedures and reduce the transportation costs considerably. - 2 years warranty for all equipment.